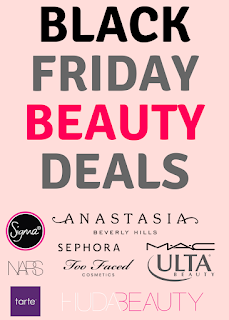 It retails for $24.99 USD at Ulta and NYX Cosmetics website. You can also buy singles for $5 USD each (Not sure if these are available in stores though). I bought mine at IMATS Toronto for $26.99 CAD. I got a 20% discount, so ended up paying about $24.40 in total ($21.59 plus taxes). 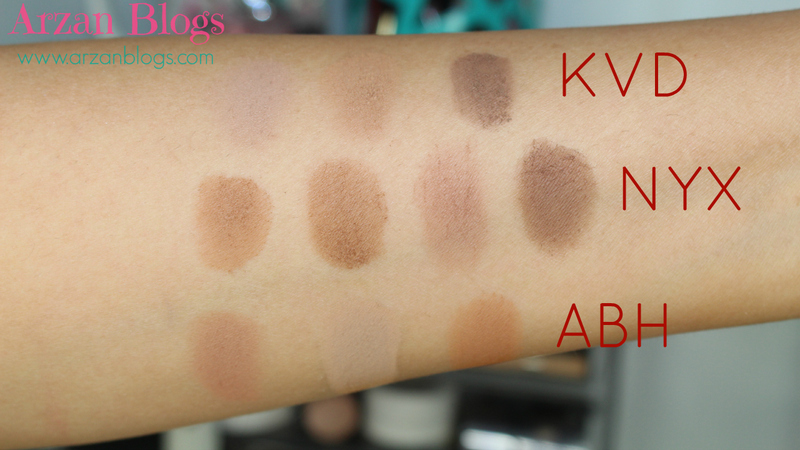 Watch my video for demo, swatches and comparison with Kat Von D Shade + Light Palette & Anastasia Beverly Hills Contour Kit. The palette comes with 8 customizable shades containing 0.09 oz each and in total of 0.72 oz. 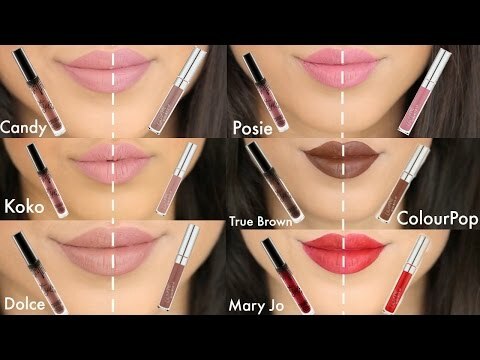 It is refillable, so you can take any of the shades out and refill them with singles (sold separately for $5 each). 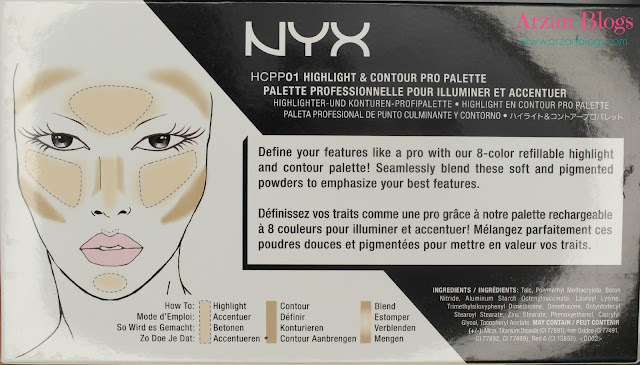 On back of the box, there's an illustration of contour and highlight areas, so it's helpful. The ingredients are also listed there. You can also find the ingredients on back of the palette. Here are swatches of 4 highlight shades: Ice Queen, Soft Light, Cream & Nectar. Both photos were taken with flash but one is taken with ring light and the other one without ring light. 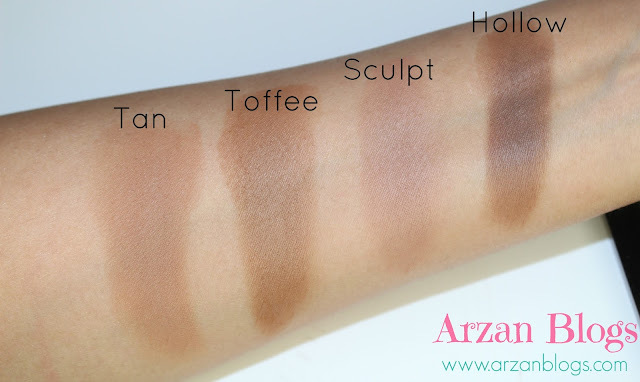 Here are swatches of 4 contour shades: Tan, Toffee, Sculpt & Hollow. Both photos were taken with flash but one is taken with ring light and the other one without ring light. 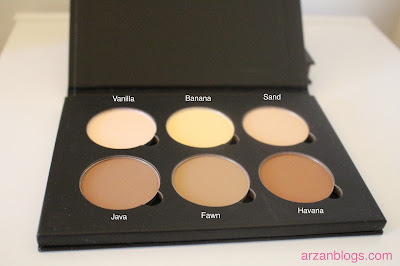 I'm quite impressed with this palette! 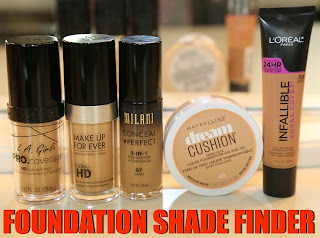 I think it's a great value if you're planning on using a lot of these shades. 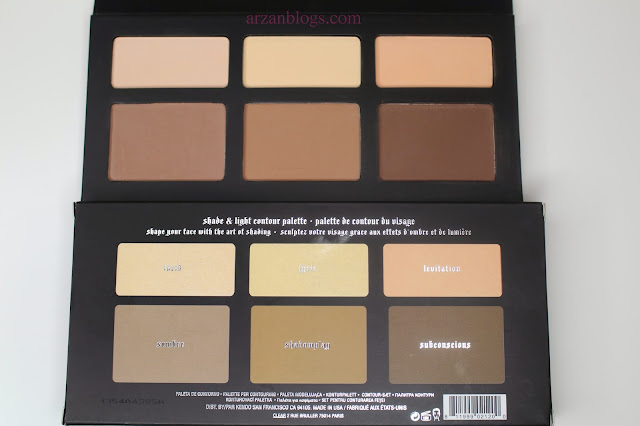 However, if you think a lot of these shades won't work for you then you do have the option to buy each shade separately for $5 USD, which is a great option for those who have very light or deep skin tone and many contour kits don't work well for you. Basic Packaging: There's nothing special about the packaging. It doesn't come with a mirror or anything but personally that's not a deal breaker for me. Refillable: If you're finish with a certain shade, you have the option to buy the individual pan and refill it. The names of the shades aren't written on back on the pans though, so that's the only downside. 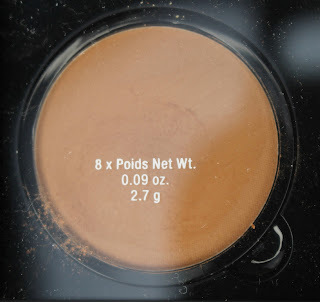 Size: Each individual pan contains 0.09 oz of product, so you get 0.72 of product in total. 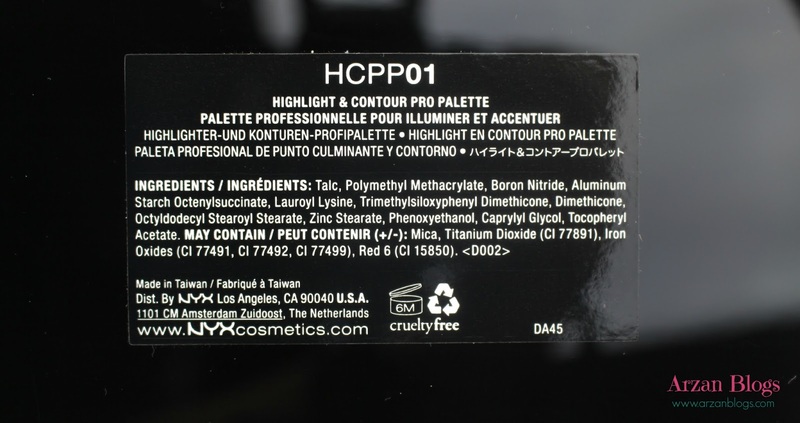 You get a lot of product for the price you pay compared to a lot of the highend palettes. Out of all the highlight shades, Cream is my most favorite shade. I find it works out pretty well with my skin tone. 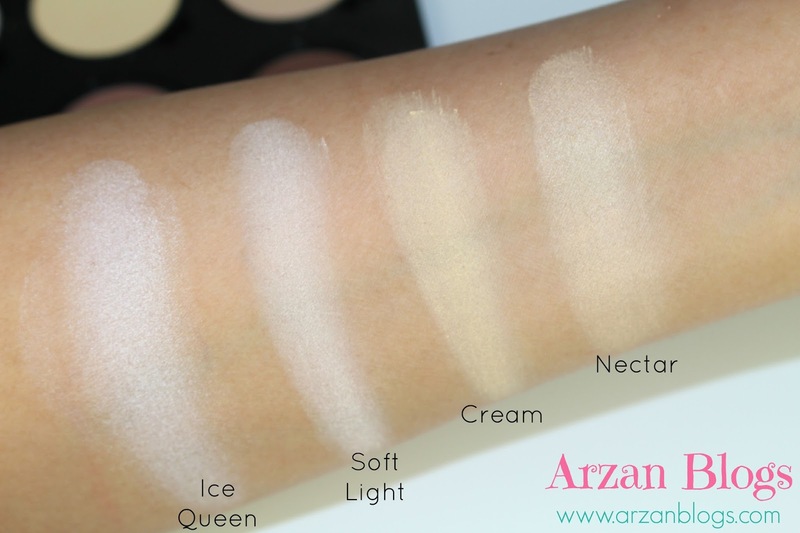 I can use Ice Queen to highlight top of my cheekbone but I do find it would complement someone with a fair complexion. 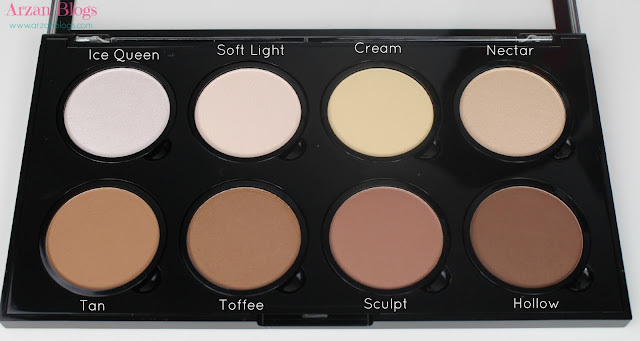 As for contour shades, I really like Scuplt. 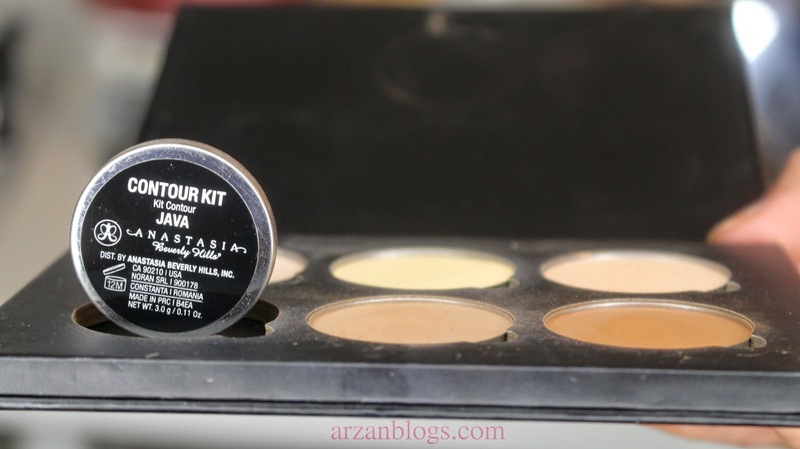 I start by using it to contour or define my cheekbones and then use the other shades to bronze my face or blend out the contour. Hollow is the deepest shade available and I do wish they sold individual pans deeper than this shade. 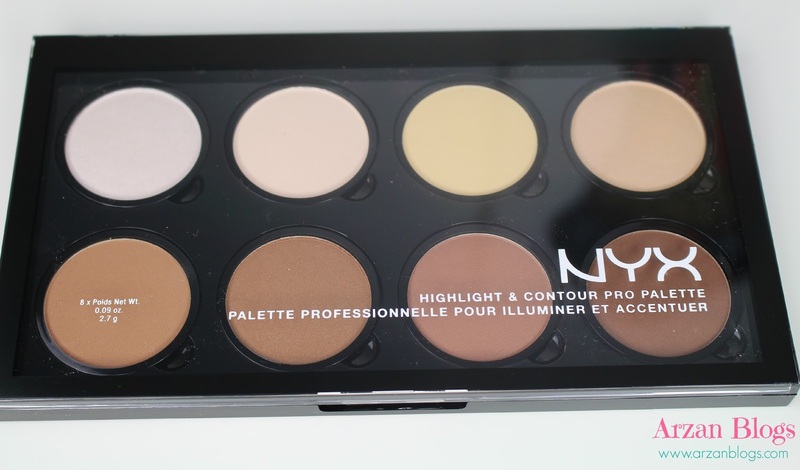 Price: KVD palette retails for $46 USD ($55 CAD), so it costs about $21 USD more than NYX. 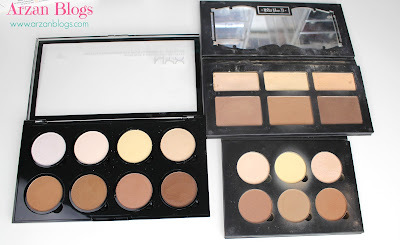 Refillable pans: KVD palette isn't refillable, while NYX palette is and singles are sold separately for $5 USD each. Packaging: KVD palette comes with a mirror, while NYX one doesn't. Refillable Pans: Both of these palettes are refillable and single shades can be purchased individually to refill them up. 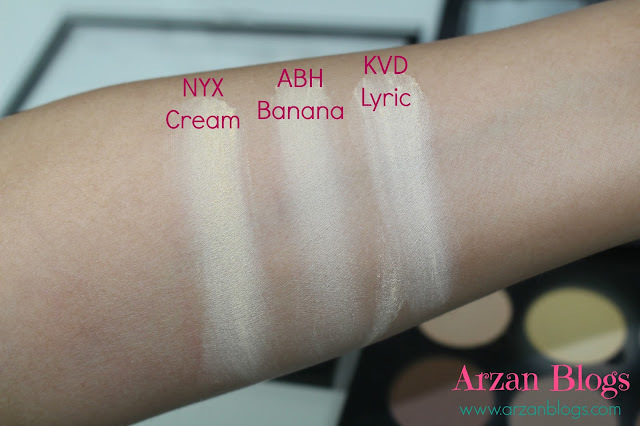 However, ABH pans do have the names of the shades on the back, while NYX pans don't. 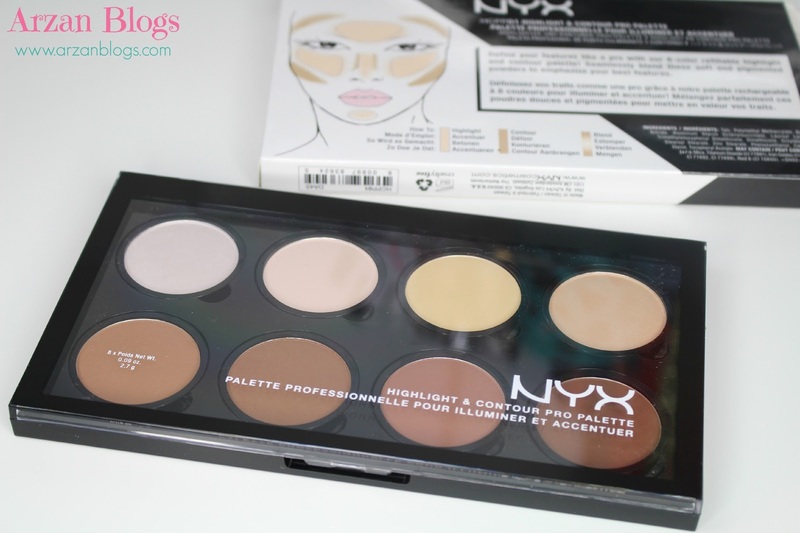 Size: ABH palette contains in total 0.66 oz of product, while NYX contains 0.72 oz. Price: ABH palette retails for $40 USD ($52 CAD), so it costs about $15 more than NYX. 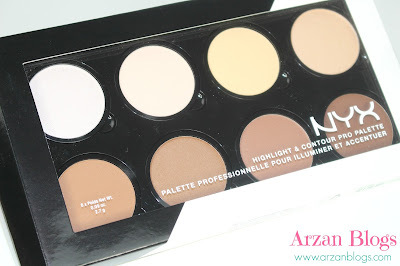 Number of Shades: ABH Contour Kit contains only 6 shades, while NYX palette contains 8 shades. Each of the palette has a yellowish shade and personally I find NYX Cream is quite similar to ABH Banana shade.